Sergeant McKinley Co. E. 23rd Ohio Vol. Infantry, while in charge of the Commissary Department, on the afternoon of the day of the battle of Antietam, September 17, 1862, personally and without orders served “hot coffee” and “warm food” to every man in the Regiment, on this spot and in doing so had to pass under fire. It also lists McKinley’s political offices and two elections to the Presidency. Many people laugh at this inscription, as seemingly underwhelming and absurd for such a large monument. Jay Luvaas in his battlefield guide sarcastically encouraged his students to view the monument and “ponder the origins of battlefield immortality.” I’m guilty of it too, having used the McKinley Monument as a light moment on battlefield tours I’ve led. Upon further review, more texture emerges. When McKinley died, he left a transformed nation with an overseas presence unlike ever before in our history. At the time, Antietam was one of the 4 new battlefield parks, which had become centerpoints of Civil War memory. 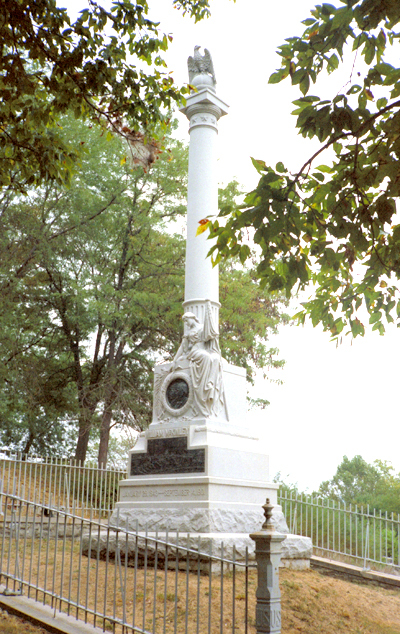 Supporters of the martyred President wanted to note his connection to one of them, and the monument is less about the actions of a sergeant in 1862 as it is about 1901 and a Presidential legacy. I suspect the Monument’s creators viewed the key panel as the one listing the elected offices rather than the description of McKinley’s actions in 1862. The McKinley monument can also be viewed as an assertion of a generation. William McKinley was also the last Civil War veteran President, and that generation was retiring from public life. On the stage came a younger and vigorous generation personified by Theodore Roosevelt. This is one last reminder of how the Civil War shaped McKinley the man, and McKinley’s generation as a whole, placed on a site that would prominently remind visitors of that legacy. Unfortunately, a lot of that meaning has been obscured over the years, lost among the coffee and hot food. It is time for a new look at McKinley and his monument. Just as the death of JFK led to dozens of renamings in his honor, I have always felt that the Antietam McKinley was really about the death of the last CivilWar veteran president. John Hay was a big supporter of McKinley, served as his Sec. or State in fact. In All the Great Prizes by John Tlliaferro (a bio of Hay) there is a good analysis of McKinley as both a man and a president. McKinley’s stock may be on the rise! Nice to see this recognition of the famous McKinley monument! For many years, the Buffalo (NY) Civil War Roundtable – Benedict Maryniak Chapter has bestowed a commemorative tin coffee cup to first-time presenters at its meetings. Dubbed “The Billy McKinley Cup”, this token and its accompanying testimonial pays homage (with tongue firmly planted in cheek) to Sgt.. McKinley’s battlefield exploits. Given the unfortunate consequces of the President’s 1901 visit to our fair city, we have always felt this in some small way helps balance the karma. In Karl Rove’s book “The Triumph of William McKinley” he reports that McKinley was only 19 at the time of this incident. Rove states that McKinley’s wagon was struck by a cannonball and the 23rd Ohio cheered his arrival. Years later, his fellow soldiers recommended him for the Medal of Honor for this incident at Antietam, but McKinley stopped them. The Ohioans were clearly impressed. Rutherford B. Hayes repeated the story for years. A just and fitting review of Pres. Mc Kinley. Thank you Chris .Sorry i missed you at the round table . was out of town. only heard good things . Thanks! See you next time I’m there.